With a headache free experience, we will take care of all your reservations & cancellation needs with the target tour company. Read our FAQ to get more details. 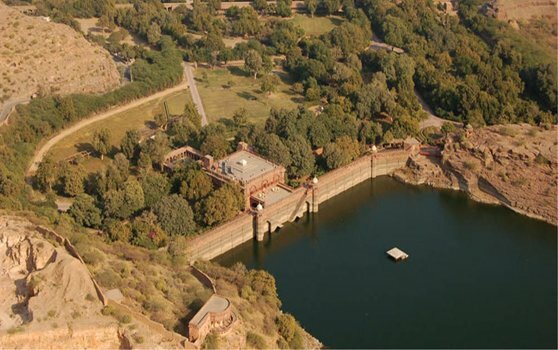 Balsamand Lake is a lake situated 5 km from Jodhpur on Jodhpur-Mandore Road. This lake is a popular picnic spot, built in 1159 AD by Balak Rao Parihar. It was designed as a water reservoir to provide water to Mandore. The lake has a length of one km, breadth of 50 m and a depth of 15 m. The Balsamand Lake Palace was built later as a summer palace on its shore. The lake is surrounded by lush green gardens that house groves of trees like mango, papaya, pomegranate, guava and plum. Animals and birds like the jackal and peacock also call this place home. ©2017 Breathtaking Destinations Corp. All rights Reserved.